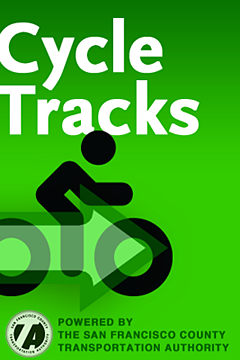 Millions of dollars go into bike plans and separated cycletracks each year around the world. These investments are intended to make city streets safer for cyclists in the hope that more of them will exchange their car keys for a helmet and a U-lock. Unfortunately, relatively little is known about where cyclists ride and how land developments and infrastructure investment affects this emerging mode of transportation. Bicyclists are one of the most illusive users of urban street grids for transportation planners. We know that the droves of two-wheeled commuters taking to the streets these days use the path of least resistance: weaving in and out of traffic and avoiding congested and hazardous car routes. Planners depend on human and electronic counters at major intersections, but that data says little about how cyclists really move through cities, where they are going and where they came from. This data then go towards informing future bicycle infrastructure investments. SFCTA seems to be putting proper privacy measures in place that will make cyclists comfortable using Cycletracks. Indeed, it’s in the interest of the cycling community to use this application. However, planners should be careful to make sure the data is checked against other more tradition sources so that tranportation models aren’t skewed exclusively towards smartphone users. Hopefully other juristictions can implement similar technologies to bring a little science to bicycle infrastructure investment.